Do you prefer engineered hardwood flooring, or solid hardwood flooring? No other type of flooring has that warm, classic look and feel that hardwood has. But you can’t just walk into a showroom and say you want hardwood floors. 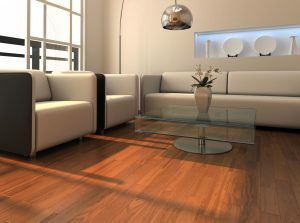 There are many, many variations of hardwood to choose from, under two main categories: engineered and solid hardwood. Which one do you prefer? What makes solid hardwood “solid” is that its planks are milled from a single piece of hardwood. It Is then coated with a clear protective coating. Most hardwood coating is usually made with aluminum oxide, ceramic, or some sort of acrylic material. The solid wood will also expand or contract relative to the current humidity level. To keep your hardwood from warping, you should keep the relative humidity inside your home between 45% and 65% year-round. When your solid hardwood floors are installed, the installer should leave a small gap between the edge of the floor and the bottom of the wall, to leave space for the expansion and contraction. Solid hardwood planks are typically ¾” thick. Because they’re so thick, they can be sanded and re-finished as much as is needed throughout the life of the floor. Solid hardwood is available in a wide variety of wood species, although some species of hardwood are only available in certain regions. Engineered hardwood takes 3 to 5 thin layers of wood and uses extreme heat and pressure to bond them together. These layers usually consist of a top layer of hardwood, backed with a couple layers of less expensive plywood. Some manufacturers of engineered hardwood will use a mixture of recycled wood fibers and stone dust to improve durability and stability. Engineered hardwood isn’t vulnerable to fluctuations in moisture and humidity, so it’s well-suited to kitchen and bathroom projects. They also work well for basements, as long as there is a moisture barrier placed between the wood floor and the subfloor. In recent years, manufacturers have been making engineered hardwood with interlocking planks. This allows them to be installed “floating”, instead of nailing or gluing every piece. To choose the right flooring for your home, it depends on the project: different varieties are better for different settings. Before going to a showroom, decide on how much flooring you will need and how much you’re willing to pay for it. If you need to, make a list of the things that the room will be used for. The more details you have, the more you will be able to narrow down your options. He with the most notes wins! This entry was posted on Friday, July 21st, 2017 at 12:10 pm. Both comments and pings are currently closed.